The Roman power, having firmly established itself on the outpost above the Exe, an admirably chosen position, which has made the city to this day the key to the south-west, was advancing steadily on into the difficult country beyond that river, where the Celtic tribes were able during many years to hold their own against the invader. But discipline and organized warfare prevailed, and at length a road, direct and well-controlled, a broad channel cut through the dense forest, was led up to the great natural rampart between Exe and Teign upon which our eyes rest to-day from the same station, though the intervening centuries have seen every form of change. The line of direction of the Roman bridge over the Exe was almost east and west, and that of the road we are considering south, the point of divergence being not now traceable, due in part to its crossing low-lying meadowlands by the river, on the outskirts of a city which has known many years of troubled history. Through Alphington, crossing Kennford, it took its course, climbing over Haldon with its merciless gradients, rising to seven hundred and sixty feet, the poorer land on the heights helping towards its better preservation. An unused portion lies above Waddon Brakes. It crossed the line of the present ‘telegraph’ road at Beggar’s Bush, and after an exceedingly steep descent in Dunscombe now passes the wall of Ugbrooke, where for a long distance it is the present main road. An unused stretch lies in Sands Copse, and then it is again in use where the name ‘Sandygate’ describes the nature of the way. A two-mile stretch of old road, broad and straight, brings us to the river where those early road-engineers found a swift moorland stream, the head of a tidal estuary, and a great expanse of water-logged marshland. It would appear that on both the East and West Teign streams there was no fording-place from Chudleigh and from Bovey to the sea except that at Hackney, where the ancient Trackway crossed. There lie, to this day, twenty feet below ground, the piers and abutments of white stone – most likely Beer stone, brought by water – which were the earliest of the various structures discovered at this spot. The bridge and its necessary adjunct, the long causeway, leading to the hard ground near Sandford Orleigh farm, seem to mark the end of Roman constructional work in the south-west. That they explored and had stations farther into the western peninsula is known, but of settled occupation this appears to mark the terminus. Thus there came into being the Tengbridge, or Teignbridge of history, a place of such consideration as to give name to one of the Hundreds of the county. There is today but one house near it, taking name from it, but deep in the alluvium around lie foundations of many buildings, showing that there was once a considerable roadway settlement on either side of the river. It is possible that one of the unidentified places in the Itineraries was situated here. The ancient Trackway leading up from Cornwall, and the constructed military road, were at this point roughly parallel and but two miles apart, and we may surely assume that a safe passage over the river and marsh, with the added advantage of a line of route prepared by the great road-makers of the world, would be preferred to a much-worn and irregular trackway which had also the danger and delays of a tidal ford. It is of interest, therefore, to observe the connecting-link of road between the prehistoric and the civilized. On climbing the hill out of the Abbotskerswell valley towards Newton, at a level stretch of the lane known as Highburrow, before descending to the hollow at Stanparks which was the course of the Trackway towards the Teign, a road is found starting suddenly away to the left, not curving naturally, but abruptly leaving the former line at an angle of 120°, and the angle is marked sharply by the hedge. This is the point where the ancient way was forsaken for the better course by the bridge. By the side of the road – which is now the usual way to Newton from Abbotskerswell – is a hollow pack-horse track, worn in places to a depth of six feet. It leads into Wolborough parish, anciently Ulborough and Ulber, and we follow a long descent of three-quarters of a mile towards the town. Rock Cottage now stands on its former course, and near by the foundations of the cottages which formed the forgotten village of Ulber lie under the turf. Along the upper end of Wolborough Street we pass on our way to the Lemon, according to Leland the Loman, which stream must be crossed to reach Teignbridge. Ford and stepping-stones were used here until the early part of the nineteenth century. Wolborough Street and Back Road are seen to be in the same alignment. Nos. 68 and 66 have the old line, and 64 and 62A have been brought up to the line of the modern street, properly known as High Street. The ford crosses the bed of the little river obliquely, while the small Union bridge passes squarely above. The remaining portion of Back Road appertains to the modern town. 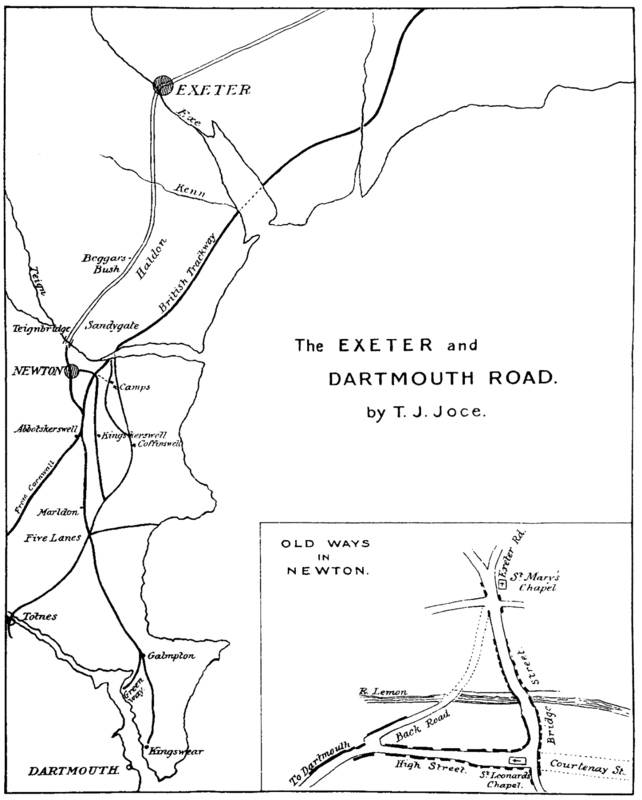 Our original line, it would appear, occupied a course through Messrs. Vicary’s gate up to Exeter Road. At an early period, at what date we know not, the first bridge was thrown across the stream some yards lower down than the ford, and to cross it a deviation from the fording-way would need to be made by men and animals to get into the straight for the bridge. This is what we notice. At a point in Wolborough Street the ford-way was left for a new route by what became in after years High Street. At the angle between the two ways was formed the Pound, whence came ‘Pound’ Chapel. The wayfaring folk traced the full and emphatic curve so noticeable in Newton to-day, and which is by no means a mere street turning from Wolborough into Bank Street (formerly Bridge Street). After curving thus, the way crossed the bridge up to Exeter Road. The west side above the bridge shows how irregularly buildings have at various times been brought out towards the present line of street. At the higher end of the town the original width may be seen, narrow at first by the old cottages of Exeter Road, wider at Elm Cottage, and so on to the Gilberd Almshouses. It is likely that the earliest way to Teignbridge was not the present one over Whitehall, but along the upper part of Jetty Marsh Lane and the grounds of Sandford Orleigh, keeping above the marshland till the causeway was reached. Both above and below the Lemon bridge a settlement sprang up, perhaps receiving its name of Newentone from the dwellers in Sherborne, a small hamlet a few hundred yards lower down the stream, and of which only the name of the Town Mills preserves the record. Having position in different parishes, under separate ownerships, the small groups on either side of the stream came to have separate and distinct entities, and to some rivalry in markets. Turning now to consider for a while the course of the oldest road from Totnes, we shall find that at a convenient spot that also was forsaken and another line of direction followed to the Roman Teignbridge. The writer has the misfortune to differ from the largely-accepted idea about Totnes, and holds that it stood not on an east-and-west through trackway, but that it represents the lowest fording-place on the Dart, or Darent, and was the ‘way out’ up from the rich lands of the South Hams towards the north-east and north, and the roads leading to it come evidently up from the southward, cross the river by the ford, a few yards below the island, and lead to the high ground above Bridgetown. The ford existed before the bridge, and the town street is the deviation curving round from the south, leading over the bridge to join again the old line from the ford, going past True Street and Berry along the elevated ridge of Beacon Hill to that commanding centre of the district – Five Lanes. For a long distance the line is a parish boundary. Keeping its direction at the summit crossway we come by a long gradual descent through a deeply sunk lane to a point near Edginswell, or Agilswell, where the marshland of the Aller stream is narrowest. The Torquay railway line has made some alteration here at Scott’s Bridge. Across the modern turnpike road, up a gentle ascent, a hollow road by the side of our way, we reach the crossway above Fluder, and continue past Well, now Coffinswell, up Blackenway, with a loop road over Coffinswell Down, over Newtake Plantation and down Hackney Lane to the same Teign-ford as that taken by the great through Trackway from Cornwall. We here see the tracks converging into one on the north shore of the Teign. On Milber there is some evidence of the way in which the Roman invaders commanded these old tracks. The well-known circular camp has immediately above it, and almost contiguous, an earthwork which has not received so much attention. We need not doubt which is the later work. It is a straight-sided, rectangular camp with somewhat rounded corners, and has been almost tilled level again. It can be seen on either side of the St. Marychurch road, and lies adjacent to the ancient Blackenway mentioned above. On the lower side it commands not only the great entrenchment, but lower still under the same extensive down ran the ancient Trackway from the extreme southwest. The higher earthwork is not of great size, and its water-supply could never have been abundant. From the centre of the earthwork there is a paved way of large flints laid without foundation, uncemented, about ten feet in width, passing through Milber woods, and its course may be seen as low as the orchard of Penninn Nursery. Its position lies exactly between the two old tracks, and the writer considers the upper earthwork to be a Roman exploratory camp of a temporary character, cast up by the conquerors when thrusting themselves into the difficult fastnesses of the west, and its date is perhaps many years earlier than the settled work of the great road which ended at Teignbridge. Milber would appear to have been Milborough, as Bilver is Bilborough and Ulber, Ulborough. The oldest way from Totnes ford to Hackney ford was left at Five Lanes, and a line taken past Marldon, along the Compton valley to Maddacombe Cross, and up a stiff hill which still has its hollow track, down Great Oak Lane to Abbotskerswell. Out of this deep valley an easier line was taken partly up Hall Lane, over Ham field, and up Firestone Hill to the Lemon ford and Teignbridge. Returning again to Five Lanes, we have to the southward the important landlocked harbour of the Dart estuary, its waters hidden by circling hills. From this height a way was taken by Windmill Hill, Smoky House, by King’s Ash, by Hook-kilns, or Hookwells, along Langdon Lane to Galmpton, anciently Gaynton, and to the ferry by the Greenway. Another way climbed the hill by Galmpton Lane, which after “Collins’ Grave” is the modern road to Kingswear ferry. For many years after the eastern side of the island had been settled by the Saxon invaders a stubborn resistance to the foe was maintained by the British in the west, and Athelstan, pushing on after his conquest of Exeter, would surely find himself near that magnificent harbour which could not fail to be entered by the early sea-rovers passing down Channel. It was soon recognized as a port of embarkation for France. William of Normandy marched through that narrow gateway of the west – the old Exe Bridge – and made another language to be heard in South Devon by wondering peasants, who themselves used that broad old speech which we have to this day. William Rufus, with a martial train, used the same route in 1090. A hundred years later the road grew busy after an unwonted manner, for the Crusaders on their hapless journey, full of high religious and chivalrous feeling, with their King, Richard of the Lion-heart, with an immense following of horse and foot, and it may be with the battle-axe of renown, together with all the appurtenances of a great military gathering, passed along this historic way to the same goodly haven to which but a sorry remnant returned, to ‘saunterre’ through the land, often laden with foreign diseases, causing leper hospitals to be set up, of which one arose in Newton. 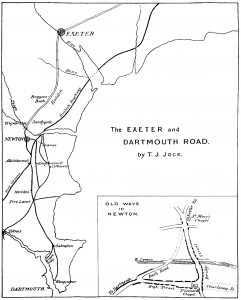 The little township by the Lemon, being situated halfway between Exeter and the port of Dartmouth, occupied a most convenient position for break of journey and for rest of men and beasts. There is reason to believe that the two chapels, hard by the road, came into existence as wayside chantries, where pilgrims paid their devotions. ‘Beggar’s Bush’ seems to have been a pitch for a begging friar, who was greatly interested in the pilgrims. In the town the needs of the travellers would give occupation to smiths and leather-workers and in providing food and lodging. A noticeable feature of the older part of Newton is the existence of long ranges of small dwellings – the Newton courts – occupying probably the site of the hovels and lofts where wayfarers rested for the night, their weary pack-animals and saddle-horses below. A considerable number of these yards and courts existed, the entrances often low and of varying widths, and it leads us to infer a great amount of road-traffic. The town never had pride of position by charter or from the prestige and protection of a great name, but was in very truth in its narrow thoroughfare, which crossed the bridge and led round into its High Street and on to the far lands of the west, a travellers’ town, literally, in the exquisite words on the tomb of Dean Alford at Canterbury – “The wayside resting-place of a pilgrim toward the Holy City ” (Diversorium viatoris Hierosolymam proficiscentis). During the long French wars of Edward III thousands of soldiers sailed from the port, and the road knew the tramp of the companies who were to win fame as the bowmen of Cressy and Poictiers, and for centuries there was unceasing traffic. The vogue of a great pilgrimage to the Spanish shrine of St. Jago di Compostella lasted for several years from 1428. “The Duke of Clarence, the Earl of Warwick with their wyffes and company, roade to Dartmouth and embarqued for Calys”, doubtless an attractive and picturesque cavalcade, in 1470, and as it was spring-time it maybe that the pleasant journey made up for the longer sea passage. The awakening to ocean voyages and exploring of distant climes which marked the sixteenth century gave increase of trade to the road and port, and Devon seamen were foremost in that wondrous time. Products of the tropics and of the Newfoundland formed the cargoes transported from Dartmouth into the shires. Newton knives and fish-hooks and other articles of local manufacture were sent away, and seamen’s yarns were spun, and the beginnings of England’s sea-control were heard in Newton taverns. But in the great Elizabethan age the climax of excitement came with the news of the Armada – the road was a main line of dispatches and of badly needed ship-supplies. The sea was near, and the enemy a reality. In the long war, ‘Spain’ was the one name which stirred the blood. Many folk for miles around came to look on the huge prize galleon, San Philip, brought safely into the harbour. Not only did Drake, Hawkins, and other dauntless captains draw rein in the little half-way town, but down from Exeter there went one sent in haste from the indignity of a prison in the Tower, that illustrious son of Devon, Ralegh, even then under guard, sent by a queen of varying temper, yet shrewd enough to know his worth, to take charge of the vast carrack, Madre di Dios, just lately captured by Sir John Borough and brought into port, which an ungoverned populace was rapidly despoiling and turning into a dismantled hulk. War declining, trade increased the harbour’s business as a port of call. Leland, travelling the country over, mentions in his precise way the creeks and points on the Kingswear side. The persevering Ogilby, with his measuring-wheel, marks each rising and falling gradient to Exeter, but later in his century a different course was taken to avoid the deep Abbotskerswell Vale by descending towards Kingskerswell along Red Hill, above the church and Castle Dinham, crossing Langford, and so into Newton by Keyberry Road (East Street). In the sadly disturbed times of the Civil War the road again knew the tramp of armed men, Royalist and Parliamentarian, encamping and skirmishing throughout the district, till the unworthy Goring, hurrying off with plunder, took ship at Dartmouth. The troops of Fairfax stayed in the outskirts of Newton for some days. During nearly a week in November, 1688, regiments of foreign soldiers, welcome, yet scarcely welcomed, were passing in detachments along the road, sorely tried by their first acquaintance with the mud of the good red earth, following the Prince of Orange over hills the like whereof could not be seen in the Low Countries. Many years later, engaged in the work of leading another peaceful revolution, there rode along the historic way a venerable clergyman, who bore the honoured name of the Rev. John Wesley. With a settled government came a period of great prosperity in woollen manufacture and in agriculture, and the coaching system demanded a better condition of road than had sufficed for pack-animals and lumbering wains. The course taken in the present day differs almost entirely from that of olden times, and towns and villages are altered beyond recognition. Yet there is one part so little changed that though for towering mast and spread of canvas we have steel and steam, as travellers in bygone days looked down upon it we now behold that matchless Dartmouth harbour, set deep within its frame of hills, a noble picture of sun and clouds and woods and sparkling waves.